This palette has been designed to keep acrylic colours wet and workable for a long period of time. It consists of a lidded tray into which a membrane system is placed and moistened. Acrylics can then be used on the top layer as a normal palette. Closing the lid ensures the system remains moist for days, and water may be added to extend the storage period further. This economical palette is 13" x 9.5" x 1" (33cm x 24cm x 2.5cm). It is a rectangular shape and has a transparent removable lid. 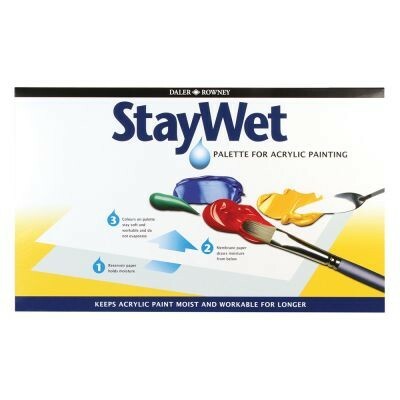 The palette contains 3 sheets of absorbent reservoir paper and 12 sheets of membrane paper.